to snuggle up under a New Quilt! I’ve combined two traditional quilt blocks to make this pretty & fun quilt. Or have fun with any color combinations you want! 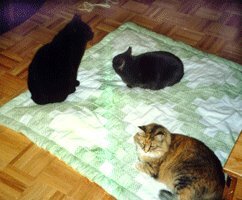 Each block is over 20 inches square so you’re still working with large pieces, and the quilt will go together quickly. I hope you enjoy making SusannahsShootingStar. The pattern comes in a PDF file which has the Mini-Block Instruction Booklet first then the pattern. PayPal should direct you to a Thank You page where you can download the pattern. I will contact you when I've seen you purchased this pattern and check to see if you were able to download it. differences in the way its pieces were cut out. I don't know how this particular block acquired its name. the beginner. The simplification also removed a difficult "Y" seam feature. it would be easy for a beginner and it was a pretty block. from "Ladies Art Company" first catalog -- dating it to 1895 or earlier. so maybe someone thought Shooting Star was a good name for a comet-inspired quilt block. 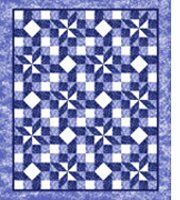 Enjoy making your SusannahsShootingStar Quilt! A baby quilt which started a trend... Don't make a quilt for one child if there are siblings! They published catalogs into the 1970s. In 1895 an ad for their Quilt, Sofa, and Pin Cushion Patterns listed 272 patterns. By 1906 it listed 450 patterns. In 1922 they introduced a second catalog entitled Quilt Patterns: Patchwork and Applique and Susannah appeared in it with a number of 485. Shooting Star had the number 14.